Mega Bloks a publié un communiqué de presse détaillant l’ensemble de ses gammes en prélude à la Toy Fair de New York. Parmi les annonces, remarquons la transformation d’American Builders (une gamme que nous vous présentions il y a quelque temps) en World Builders. Un changement cosmétique pour la commercialisation de sets à l’international qui rappelle un peu les modifications apportées aux jouets G.I. Joe dans les années 80 (« Héros sans frontières » vs « A Real American Hero »). Notez que les marques connues jusqu’ici : John Deere, Jeep et CAT, sont rejointes par une autre mais non-commerciale : NYPD. Mega Bloks poursuit l’exploitation des licences Mattel : Barbie et Hot Wheels. Ils ont également misé sur des licences à forte identité visuelle comme Bob l’éponge (dont on vous parlé l’autre jour) et Hello Kitty! (qui fête cette année ses 40 ans). Du côté des jeux de construction pour adultes ou pour collectionneurs (Mega Bloks Collector), HALO poursuit sur sa lancée avec Call of Duty, une gamme que nous apprécions tout particulièrement à la rédac. Deux sets notamment sont annoncés pour Call of Duty : Mob Of The Dead et Heavy Lift Copter. Chez HALO, notez l’arrivée d’un véhicule radio-commandé le UNSC RC Attack Mantis. The global leader in preschool construction builds on its success with a fresh new look and all-new toys! Parents can discover a broad range of fun preschool building toys, each one featuring key developmental benefits for their little ones. Boys and girls alike will delight in the all-new Mega Bloks First Builders Bobby Barn Musical Farm, which combines building and stacking play with cute characters and fun farmyard sounds for hours of creative play. The new Mega Bloks First Builders Fast Tracks Raceway and Rescue Team include innovative, easy-to-build tracks and mix ‘n match vehicles for an exciting preschool vehicle play experience. Build the fun and friendly world of Thomas & Friends with new buildable tracks, loads of play-features and the classic Thomas characters. The new Thomas’ Ultimate Adventure Table gives kids a strong and sturdy play platform to create their own tales from the Island of Sodor. Welcome to the cute, crafty & creative world of Mega Bloks FurEver Families. Girls will love the combination of easy building, mess-free crafting and the lovable animal families with their irresistible furry tails! MEGA BLOKS FurEver Families is a unique, all-new way to play. Girls can now Build, Craft, Play to create adorable sets like Miss Mouse Schoolhouse, Bear’s Fresh Market, Fox Family Treehouse and many more! Build The Barbie World You Imagine! Mega Bloks Barbie invites girls to build, design and decorate with Barbie & friends fashion figurines, fab accessories and over 25 themed playsets including the all-new Fantasy Collection featuring Mermaids and Fairies! Girls will love Barbie as a mermaid swimming undersea in the Mega Bloks Barbie’s Underwater Castle. Barbie as a fairy can « fly » over the Mega Bloks Barbie’s Fairy Treehouse. The new Mega Bloks Barbie Rooms to Build modular system allows kids to customize each room, then build them up into condos, mansions or even a shopping mall! This year is Hello Kitty’s 40th birthday! The cute and collectible world of Mega Bloks Hello Kitty includes fun buildable playsets, charming figurines and tons of accessories for fans to personalize their Hello Kitty world. Get ready for Mega Bloks KAPOW!, an elite range of futuristic Battling Blok Bots hitting the ring this fall. Choose your Blok Bot, arm for battle and claim ultimate glory! Kids will love the quick builds that let them create these ultimate fighting robots. Each Mega Bloks KAPOW! battling Blok Bot is over 8″ tall, and features kid-powered lightning-fast punching action to allow players to knock their opponent’s blocks off! Discover the awesome robot designs at collectible price-points, hitting retail arenas this fall. The Mega Bloks World Builders construction toy line features four globally recognized brands that kids and parents love. From harvesting crops with Mega Bloks John Deere®, or building cities with Mega Bloks Caterpillar®, families will love building together with authentic vehicles and playsets. In 2014, the line expands to let fans recreate their outdoor adventures with Mega Bloks Jeep®, or be the hero with Mega Bloks NYPD®. 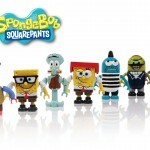 MEGA Brands’ licensed partnership with Nickelodeon is expanding to offer an exciting range of Mega Bloks SpongeBob SquarePants construction toys for fans to build their favorite characters and their very own under-the-sea universe. Starting Fall 2014, kids can find Mega Bloks SpongeBob SquarePants in the construction toy aisle with collectible figures and buildable playsets like Krusty Krab Attack and Invisible Boatmobile Rescue! Build, Race and Customize! Mega Bloks Hot Wheels brings together speed, action and performance with easy building fun. The Mega Bloks Hot Wheels Turbo Tubes feature cool new buildable vehicles, collectible figures and custom parts for awesome rebuilds, and the Mega Bloks Hot Wheels Baja Bone Shaker and Dune It Up buildable monster trucks are big-wheeled mean machines! Build the Adventure of the world’s #1 kids game franchise! The new Mega Bloks Skylanders line features fast battle action with the buildable Mega Bloks Skylanders Spinners that spin and smash to win! Discover the entire collection of Hero Figure Packs and buildable playsets, like Mega Bloks Skylanders Cut Throat Carnival, Fire Fortress and Pirate Cove! Go Go Power Rangers! Kids will love to create their own adventures with the buildable vehicles from the hugely popular entertainment franchise. Along with the collectible Super Megaforce micro-action figures, Mega Bloks Power Rangers includes the easy-to-build Zords and MegaZords! 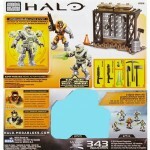 The phenomenally successful building set line is invigorated for 2014 with all-new buildable vehicles and playsets, and the introduction of the new Mega Bloks Halo super-poseable micro action figures with interchangeable armor. 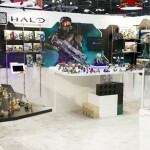 With over 20 new items in the range, Mega Bloks Halo offers kids and collectors enhanced play experiences based on the iconic Halo entertainment franchise. The Mega Bloks Halo UNSC RC Attack Mantis features a wireless remote control weapons system with multiple rocket launchers! 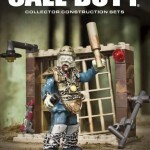 The Call Of Duty video game franchise comes to life with the Mega Bloks Call Of Duty Collector Construction Sets. Featuring highly authentic buildable vehicles, locations, and super-poseable micro action figures across more than 25 items, this Mega Bloks Collectors Series establishes a new standard with an unprecedented level of detail and sophistication. 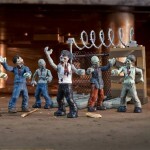 The Mega Bloks Call Of Duty Mob Of The Dead and the Zombies TranZit Farm bring out the zombies, while the Heavy Lift Copter faithfully recreates modern military hardware. 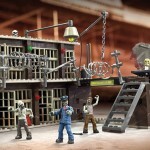 Call of Duty : encore plus de zombies par Mega Bloks ! Tout commentaire contraire à la réglementation en vigueur (et notamment tout commentaire à caractère raciste, antisémite, diffamatoire, injurieux, grossier, produits pirates, liens vers des sites commerciaux) ou à but purement polémique ou de trolling sera supprimé et son auteur sera blacklisté définitivement. ToyzMag.com est un webmagazine traitant de la culture Toys, de l’actualité sur les jouets et figurines, mais également des dossiers plus complets. Soyez informé des dates de sorties et des disponibilités en France. Créé et animé par une rédaction de passionnés, ToyzMag se propose de vous faire découvrir l'actualité des fabricants de jouets internationaux (Mattel, Hasbro, Bandai etc..) et français. Nous aimons les jouets, qu'ils soient modernes ou vintages.